However, this answer differs from the correct answer. 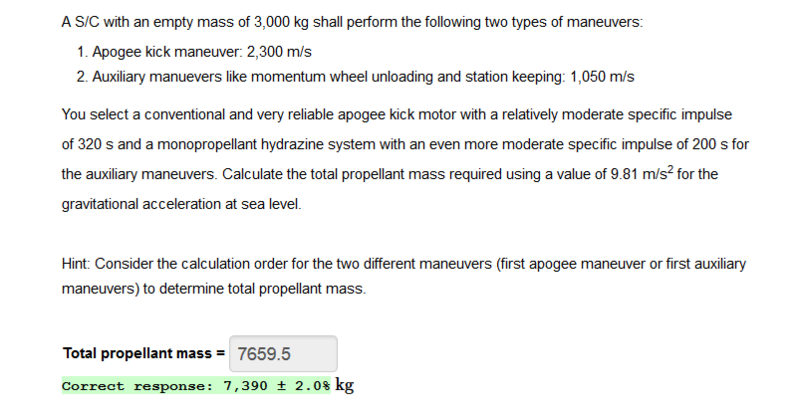 Furthermore, if I consider the manoeuvres being performed in the reverse order, I get different masses for each propellant, but somehow, the total mass is the same, which seems strange, since the hint suggests that the order matters in the total amount of fuel required. Could you please point out where did I make a mistake? Thank you. Browse other questions tagged rockets fuel or ask your own question. Is it correct to say that a LH2/LOX rocket uses water as propellant?